There are places in Portugal that never go out of fashion and many of these places are coffee shops or cafés. The Portuguese love coffee, there’s little doubting that – they always have and something tells me they always will. 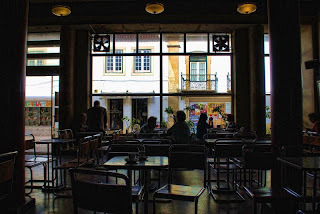 There are cafés everywhere in Portugal – every suburb, every aldeia, by the sea, inland, underground, on top of the highest mountains … they are everywhere. 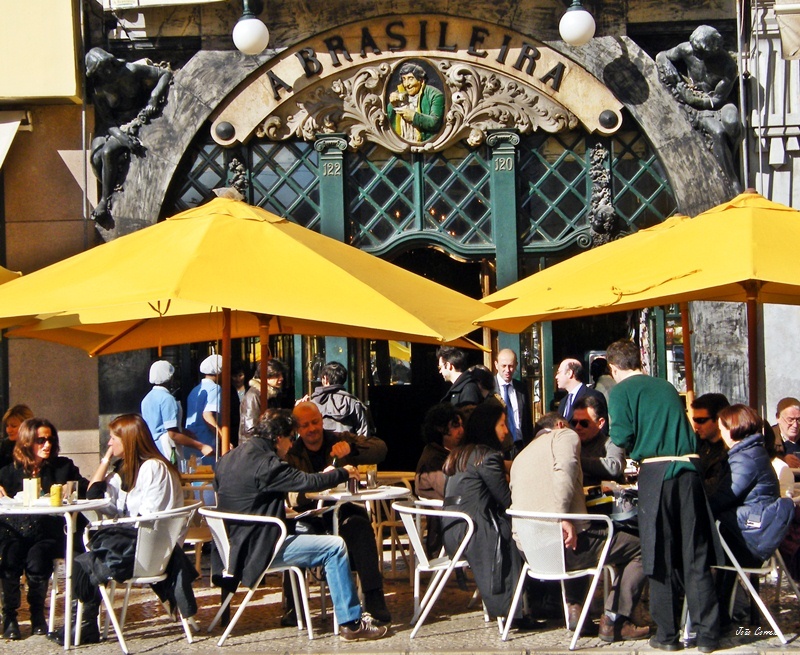 On their daily routines, the folks of Portugal grab their cafés wherever they can and they do it fast. In some cafés, however, this is ill advised. 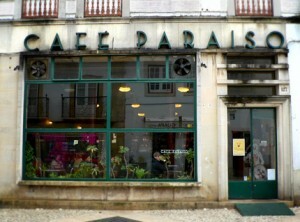 Coffee has its history in Portugal as do many coffee shops. 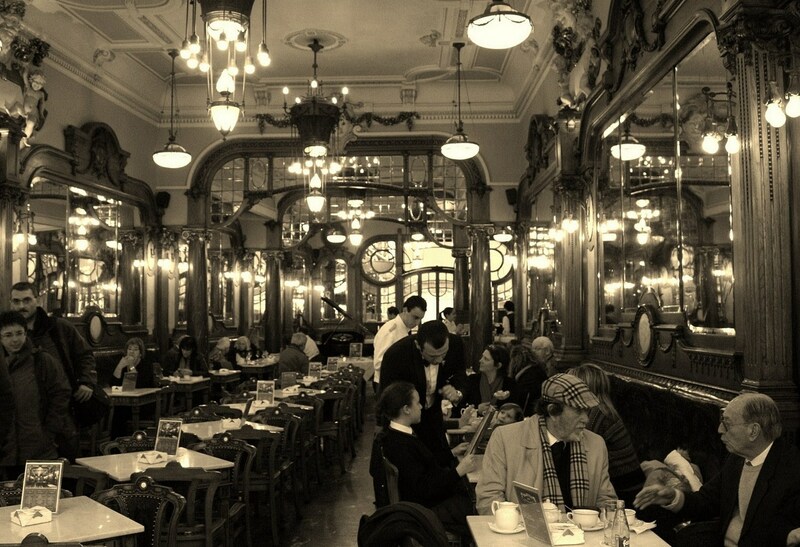 Every city and town possesses cafés that are very much a part of the local socio-cultural landscape to one degree or another. This is something Starbucks will never accomplish here (at least I hope). Now how important are the cafés of Portugal to the country? Well, lets just say that some are as important as Portuguese culture itself, for many have served to inspire the essence of Portuguese culture itself. 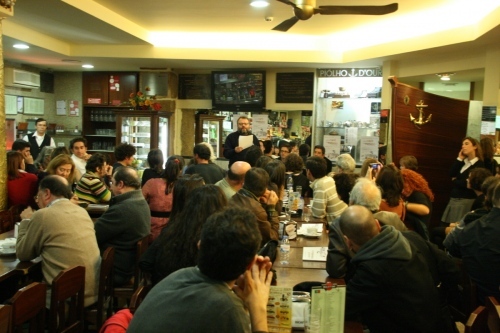 Nowhere is this truer than in the case of Portuguese literary history, for Portugal possesses a number of historical cafés that have served as a major source of inspiration for poets and writers, this beyond having been starting points for political, social and cultural rights movements. 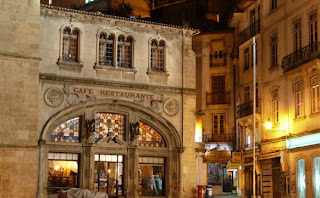 So if in Portugal and you’re hankering for some history (literary at that) let me recommend a number of cafés for you. 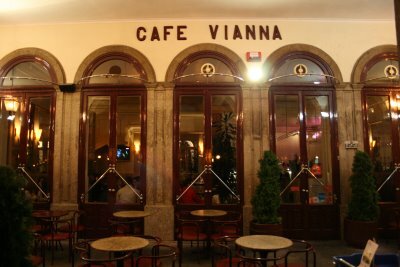 In northern Portugal, in the city of Braga, Café Vianna was a regular stopping ground for Eca de Queiros and Camilo Castelo Branco. Smack-dab in the middle of the city, Café Vianna has been under the famous arcades at Praça da Republica for 141 years. 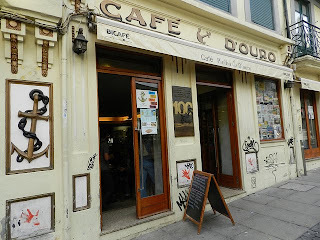 Leaving Braga and heading south-west towards the city of Porto, here two cafés are particularly worth highlighting: The Majestic and Café d’Ouro. 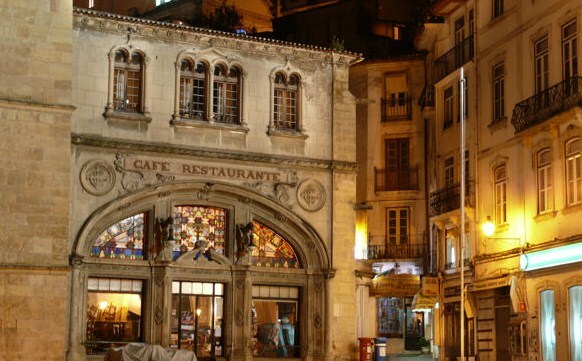 A stroll down Rua de Santa Catarina will take you past The Majestic. 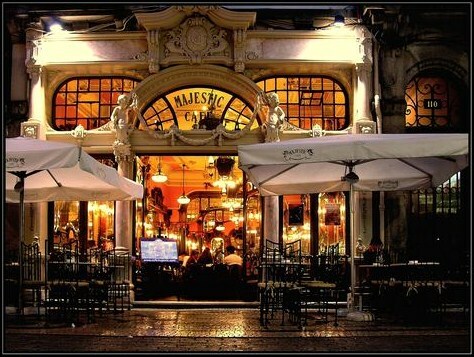 More than just a café, The Majestic is a throwback to 1920s Porto, to the city’s ‘Belle Epoche’. The Majestic quickly became a hangout for the local intellectual bourgeoisie and for writers and artists as well. 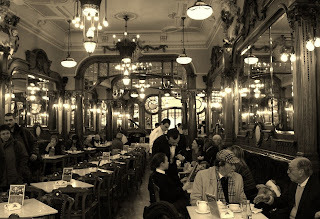 The café was abandoned for a 16 year period, from 1964 to 1980, restored during a 14 year period and reopened with all its splendor in 1994, becoming Cultural Patrimony of the city of Porto. Located at Praça de Parada Leitão, the Café Âncora d'Ouro, also known as O Piolho (Lice, in English), has been around since 1909 and is known as the academics café. Here great minds of the city have come to study and to debate and to inspire. Interestingly, O Piolho was the first café in the city to have electricity (in 1957), the first to hook up a television and the first to get the famous Italian coffee machine "La Cimbali" which lead to the name given by the residence of Porto to expresso coffee or ‘uma bica’, that of ‘cimbalino’, name that has stack until this day. Now if in the University City of Coimbra, a visit to the Café Santa Cruz and all its Manuelino architectural elegance, is a must. 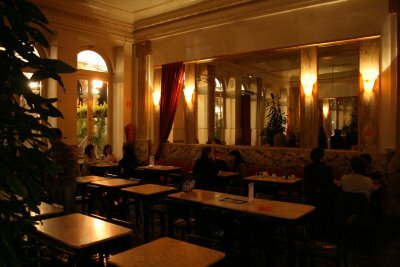 Located at Praça 8 de Maio, Café Santa Cruz has been a symbol of the city by the Mondego River since 1923. Much was the controversy when the decision was made to allow the café to exist wall-to-wall with the Santa Cruz Church, but today and through its history, this café has been a home away from home for intellectuals, writers, artists, academics, fadistas, rubbing shoulders with the working class, the wealthy and most recently, tourists. Further south but still in the centre of Portugal, we reach the City of the Knights Templar – Tomar. 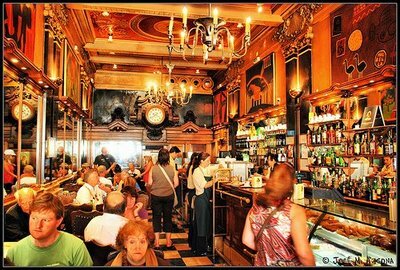 Here we can visit the centenary walls of Café Paraíso located at Rua Serpa Pinto, Tomar’s major pedestrian street. Contemporary writer António Lobo Antunes did his military service in Tomar and has had his name tied to Café Paraíso, for example. Our last stop is Lisbon. Here, three cafés are worth discussing. First, A Brasileira, located at Chiado Square, has been around since 1905. Although known through history as a place frequented by Lisbon’s top literary, artistic and intellectual figures, among these personalities, one frequent client stands out: Fernando Pessoa. In fact, the presence of Fernando Pessoa at A Brasileira was so common that, in order to recognise the poets’ link to this café, a bronze statue of Pessoa sitting at a table was installed in front of A Brasileira. 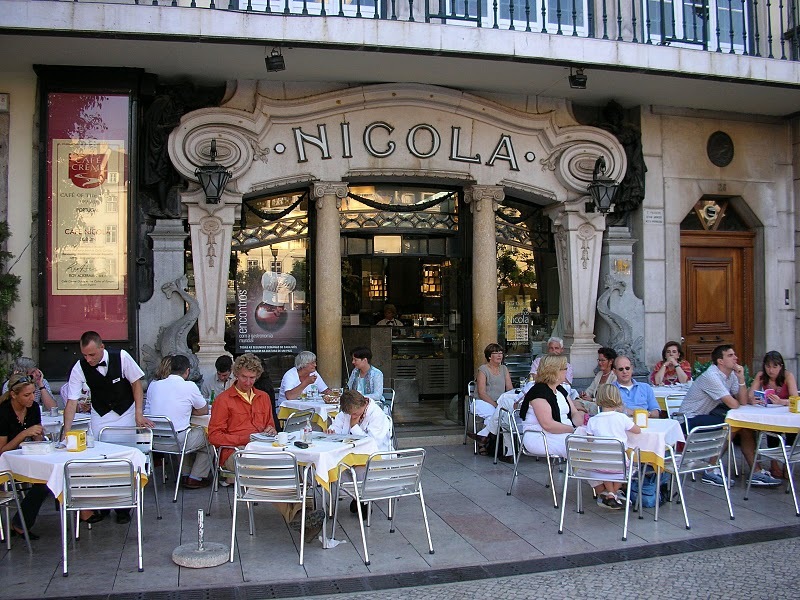 Our second Lisbon stop is Café Nicola at Rossio Square, once upon a time the favourite haunt of the much celebrated poet from Setúbal, Bocage. The art deco facade and the sidewalk sitting is today a touristic must, thus the reason why when one walks by it is mostly tourists that occupy the tables. Our last stop is under the arcades on the right hand side of Praça do Comercio (if you’ve got your back to the river). Café Martinho da Arcada has been around since 1778, originally as a liquor trade house, and in 1829 as the café that still stands today. 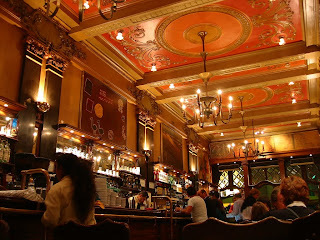 If any café in Portugal is inevitably tied to the history of Portuguese arts and literature it’s Café Martinho da Arcada. Writers such as Cesário Verde, António Botto and Almada Negreiros were regulars in their day. Fernando Pessoa also has a table permanently reserved for him here. He certainly loved his coffee shops. 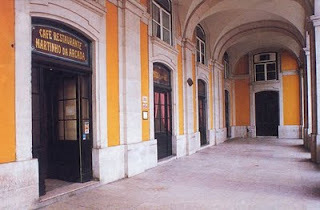 More recently, Martinho de Arcada also has a table permanently reserved for Noble winner José Saramago. So if you’re in Portugal and you think coffee is just coffee and a café is just a café ... think again. From north to south, if you’re searching out literary inspiration these ‘temples of culture’ are sure to provide you with some, and do take your time to enjoy our coffee. insightful and has surely helped girls like me to attain their goals. it does indeed present me some fodder for consideration. sent to me every time you make a new update? anybody who employess it, including me. Happy Diwali Images Can it shower every thing good in your life and fill every day with agreeable moments. Happy diwali 2018 Quotes in English Yet another year will probably be another year will soon come. I trust and hope that the lights of Diwali, Permit this diwali burn off all of your bad times and put in you in great times. Happy Diwali! Permit’S Not Forget Our Nature This Diwali, Celebrate An Eco-Friendly Diwali. Doubt is like darkness and hope is similar to light. There’s absolutely no way you can ruin light by throwing darkness to it. Thus, let us come together and revel in the festival of lights. Happy Diwali! Tension will discharge by audio, Beauty will come out with glowing diyaas, Love festivity at fullest! Best Happy Diwali 2018 Quotes Diwali is a festival filled with sweet memories, skies filled with woods, a mouth filled with candy, home filled with diyas and a heart filled with pleasure!